Orlando will be a family road trip destination for many this year. You probably know which theme parks you want to visit and what you want to do once you’ve arrived in Central Florida, but how about pit stops on your drive to Orlando? With an Orlando family road trip, driving to Orlando can be half the fun — especially if your family stops at some of these Trekaroo-approved attractions. Select your route, I-95 or I-77, and start planning your family’s stops on your road trip to Disney World. Here is Trekaroo’s guide to an Orlando family road trip. Visit Orlando and stay at these family friendly hotels! Stretching from Maine to Florida, I-95 is the most direct path from north to south along the Atlantic Coast. Road trippers driving this route know that frequent pit stops are a must on your drive to Orlando. While there are plenty of rest areas along I-95, your family will have a lot more fun if you get off the interstate to enjoy the cities and attractions on your road trip to Disney World. 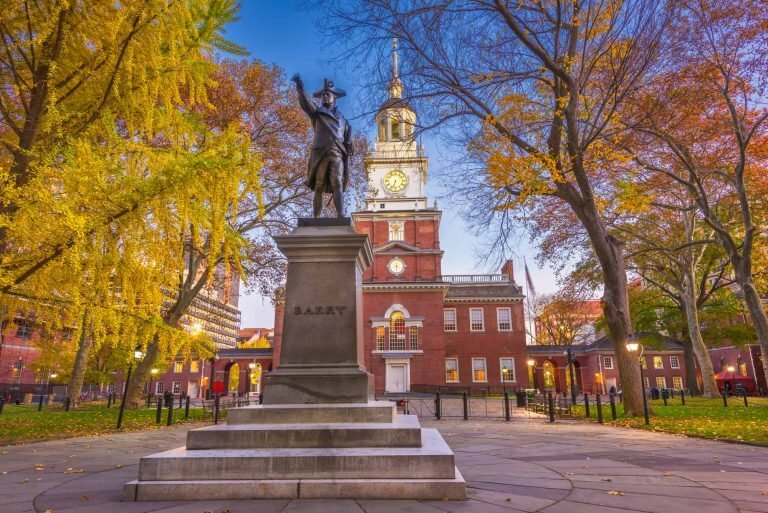 If you’re beginning your drive in Connecticut or New Jersey, the entire family will be ready to stretch their legs by the time that you cross the Delaware Memorial Bridge and say goodbye to the New Jersey Turnpike. Wilmington, Delaware is one of Trekaroo’s favorite pit-stops along I-95 on your drive to Orlando. There is so much to do only a short distance from the interstate. Looking for a quick stop in Wilmington on your on your Orlando family road trip? The DuPont Environmental Education Center is just about 5 minutes off the Rte 4/ Martin Luther King blvd exit in Wilmington (exit 6 on I-95.) 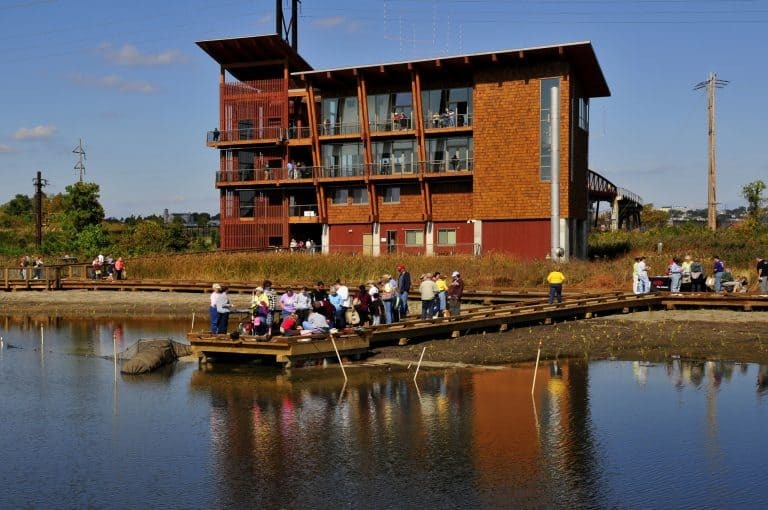 The Russell W. Peterson Urban Wildlife Refuge, where the environmental education center is located, is one of only a handful of urban wildlife areas in the country. There are trails for walking and bird-watching along the pond and through a garden featuring native plants open daily during daylight hours. Additionally, the education center building is open 11AM-5PM Tuesday through Saturday and noon-5pM on Sundays. This makes the perfect pit-stop on your drive to Orlando because entry to the DuPont Environmental Education Center is completely free! If it’s raining when you get to Wilmington and the little ones are in desperate need of a break from their car seats on your Orlando family road trip, you’ll be happy to know that the Delaware Children’s Museum is also off the same exit. 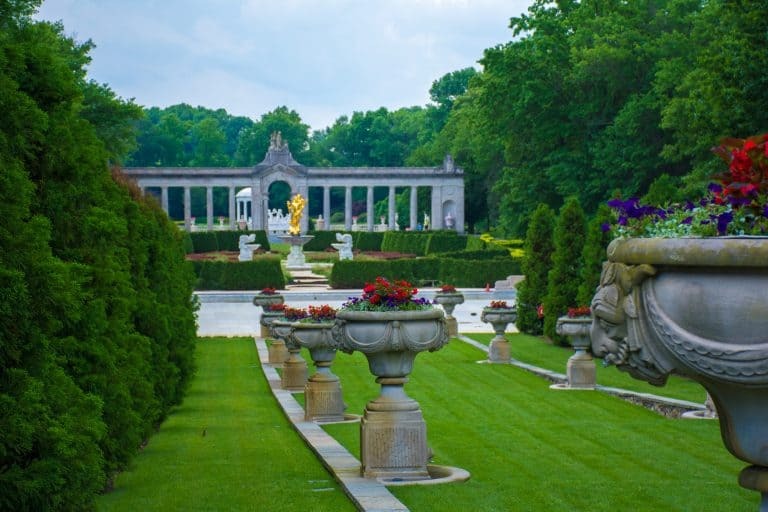 Have a bit more time to spend in Wilmington, Delaware? If you have at least a few hours considering touring one of the historic homes and gardens of Wilmington’s Du Pont family. On a rainy day, Nemours Estate is the place to go with antique automobiles and a children’s scavenger hunt inside the estate. 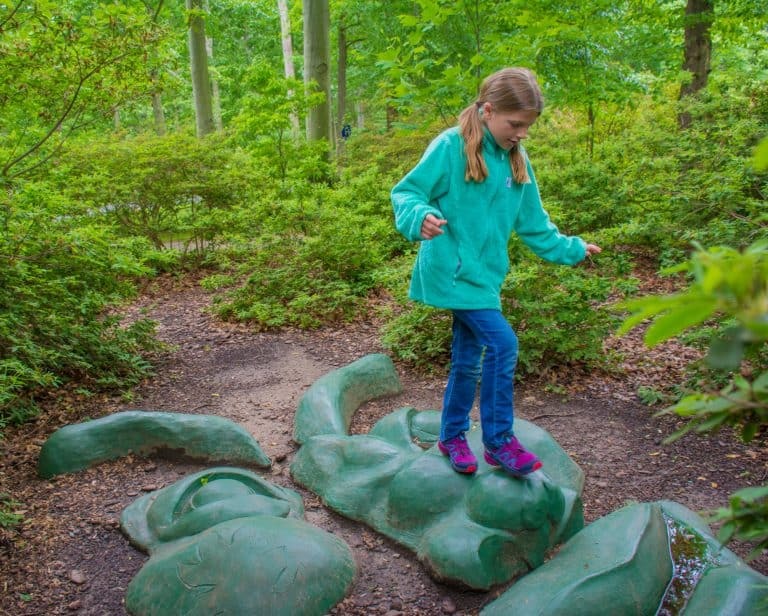 On a nice day, head out to Winterthur Museum and Garden home to some of the most beautiful and whimsical gardens in the Mid-Atlantic. Looking to stay overnight in Wilmington, DE or a full day exploring the city on your drive to Orlando? Check out Trekaroo’s Best Wilmington, DE Activities for Families. Traveling with young children on your road trip to Disney World? You won’t want to miss Annie’s Playground (off exit 74) in between Wilmington and Baltimore. It even has restrooms so it is the perfect pit-stop on your drive to Orlando. Looking for a quick stop in Baltimore on your Orlando family road trip? Trekaroo recommends a stop at Fort McHenry National Monument and Historic Shrine just 5-10 minutes off of I-95 after exiting the tunnel (exit 55.) While there is an entrance fee for adults ages 16 and over, a visit to Fort McHenry is certainly cheaper than parking at one of the notoriously expensive parking garages in Baltimore’s Inner Harbor. 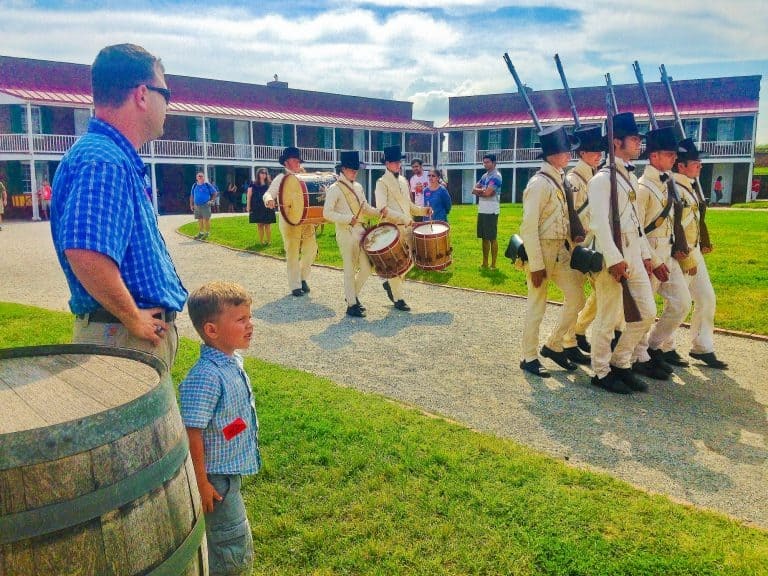 Of course, there’s plenty of history lessons to be found at Fort McHenry. Francis Scott Key penned his famous “Star Spangled Banner” poem, later to become our national anthem, while watching for the American flag to rise above the fort at dawn. 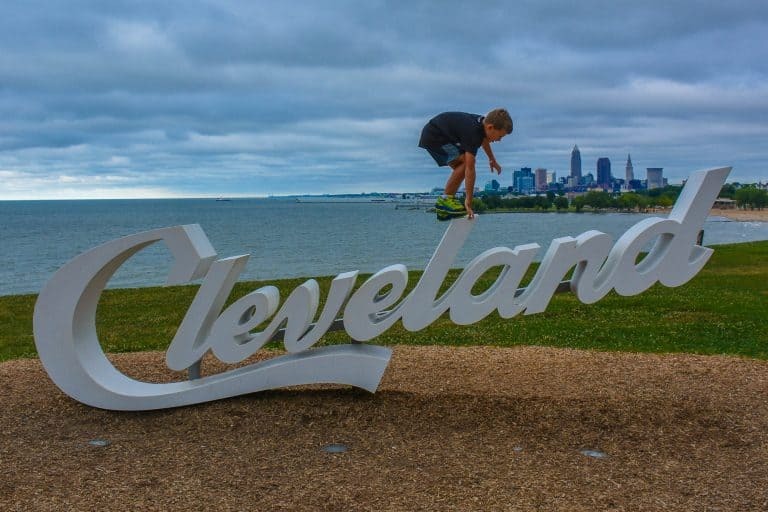 Children love to explore the nooks and crannies of this famous fort so it is also a great place to burn off some kid energy. Other quick stops in Baltimore include a visit to one of Baltimore’s free art museums, the Baltimore Museum of Art or Walter’s Art Museum. If you have more time, consider a stop at Baltimore’s Inner Harbor and the National Aquarium. Looking to spend the night in Baltimore on your road trip to Disney World? Or, possibly even a full day in Charm City? Check out Trekaroo’s Top 10 Things to Do in Baltimore with Kids. Looking for a pit-stop between Baltimore and Washington DC on your drive to Orlando? Patapsco Valley State Park is a great choice for families on a road trip to Disney World. The state park is huge, but there is a suspension bridge and a short hike to a waterfall very close to I-95. A small fee is required per car. Once you’ve made it through the Capital Region and bypassed Washington DC on your drive to Orlando, you’ll certainly be ready for another pit stop by the time that you cross the Potomac into Virginia. Families looking for a pit-stop in Northern Virginia should consider the National Museum of the Marine Corps just outside of Quantico (exit 150A.) The museum is huge and focuses on US participation in various wars and conflicts. However, it is free so families can stop in for a short visit and be on their way. Drivers can even spot the museum from I-95. It is that close. If you have more time to spend in Northern Virginia, check out Trekaroo’s resource for learning about American history in Prince William County, Road School: Civil War and American History in Prince William County, VA. Looking for a place to stop for the night on your road trip to Disney World? 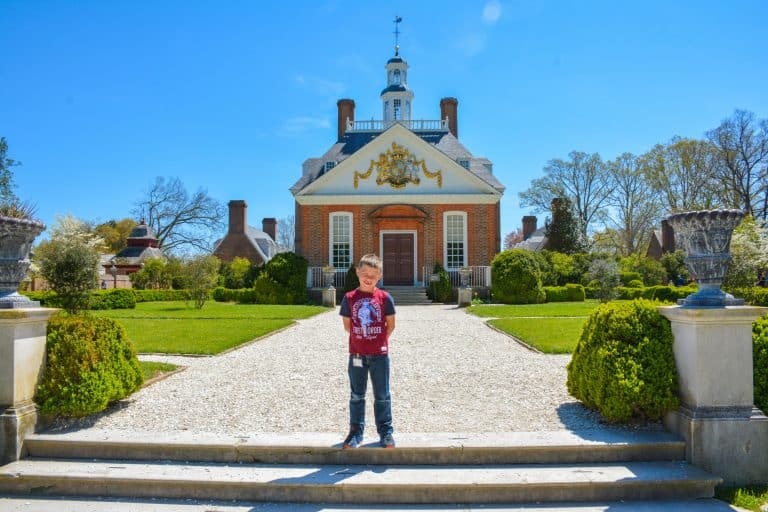 Trekaroo families love Fredericksburg, Virginia about halfway between Washington DC and Richmond. It is full of history, has several hotels just off I-95, and lots of hometown cooking. Check out Trekaroo’s guide to an overnight stay in Fredericksburg, Virginia. 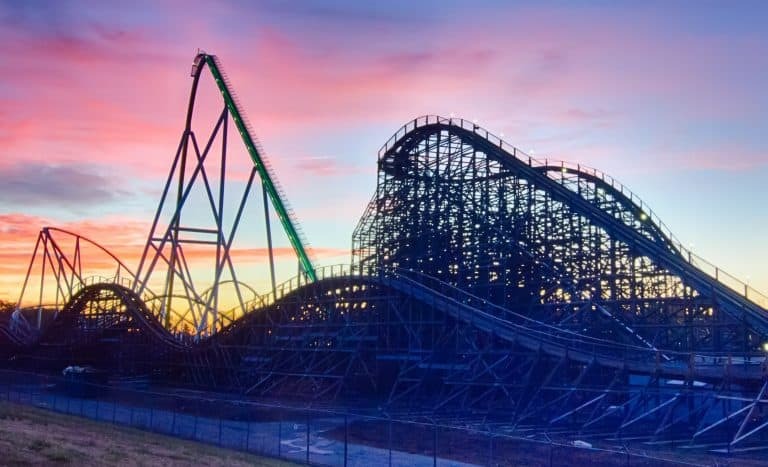 Just north of Richmond on I-95, Kings Dominion is one of the best amusement parks in the Eastern United States. If you’re in search of the best roller coasters in the East, you should certainly consider a stop at Kings Dominion (exit 98) on your road trip to Disney World. Richmond is a fun place to stop just for a couple hours or even to spend the night on your Orlando family road trip. Everyone’s got to take a break from driving to sleep at some point, right? Virginia’s capital has a growing foodie scene in its Church Hill, Carytown, and Downtown neighborhoods making it the perfect place to eat a satisfying dinner. 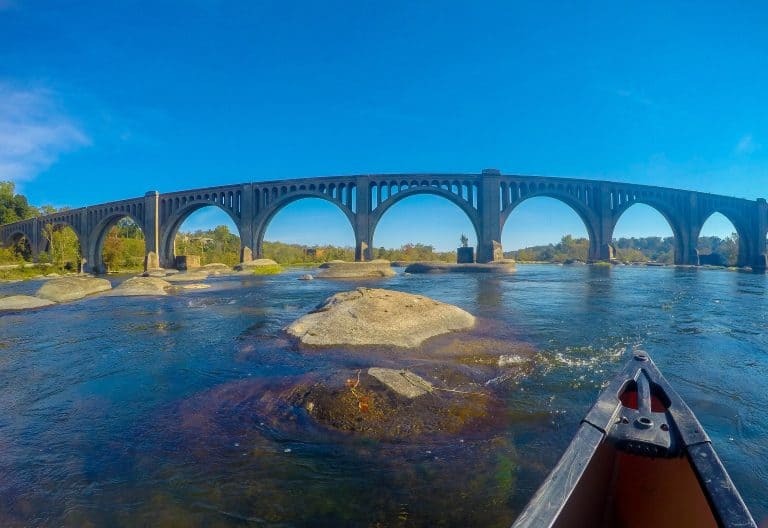 There are also museums, historic sites, and gardens to explore in this beautiful Southern city on the James River. Want to extend your Richmond Pit-Stop? Check out Trekaroo’s Things to Do in Richmond with Kids. Looking to include Colonial Williamsburg on your your Orlando family road trip? Williamsburg is about an hour east of Richmond. Virginia Beach is another hour or so beyond Williamsburg. If you’re on a mission to get to Orlando as quickly as possible, North Carolina is probably the state that you want to drive straight through making the fewest number of stops possible. There just aren’t many options for family pit-stops along I-95 in North Carolina on a drive to Orlando. However, if you’re looking to extend your road trip to Disney World into the beautiful state of North Carolina, there are many options. The easiest is to make a detour over to Raleigh on Interstate 85. The other option is to drive through New Bern to North Carolina’s coast and drive the coastal route on your road trip to Disney World. Looking for recommendations for things to do in Raleigh with your family? 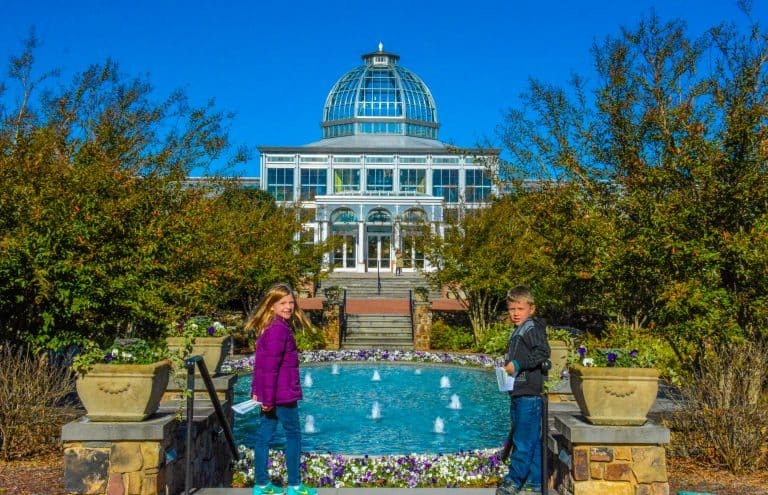 Check out Trekaroo’s Top Things to Do in Raleigh, North Carolina. Planning a stop in New Bern on your drive to Orlando? Check out Trekaroo’s tips for Exploring Historic New Bern with Kids. After driving 180 miles through North Carolina on your drive to Orlando, you’ll reach the famous rest stop, South of the Border. You guessed it, it’s located just south of the North Carolina- South Carolina Border! 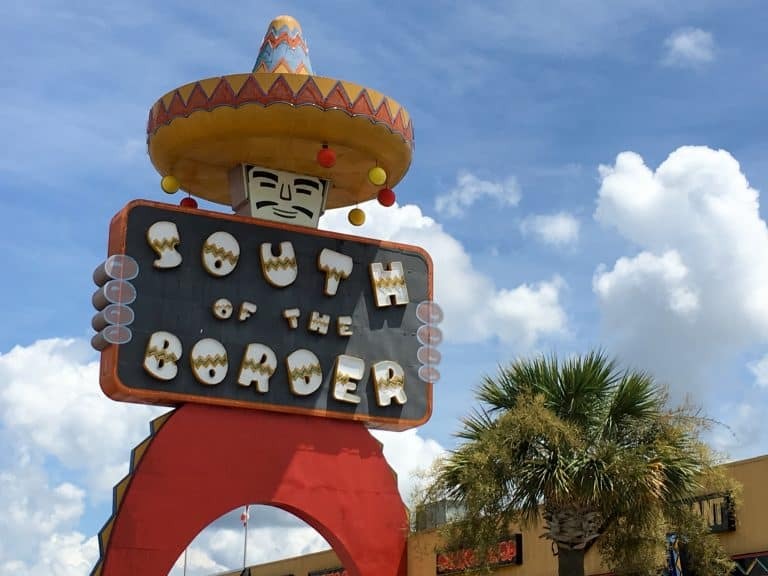 With three restaurants, a reptile lagoon, a small amusement park, and even a motel, South of the Border is easy to spot: look for the Sombrero Tower at exit 1 in North Carolina. This is a perfect stop for a snapshot of your Orlando family road trip. There are a couple of state parks in South Carolina worth a stop for families on a road trip to Disney World. Woods Bay State Park in Olanta off of exit 141 has a nature trail that circles a pond. By the pond you’ll likely see alligators and cypress trees. Another option for families driving to Orlando is Colleton County State Park in Walterboro off exit 68. 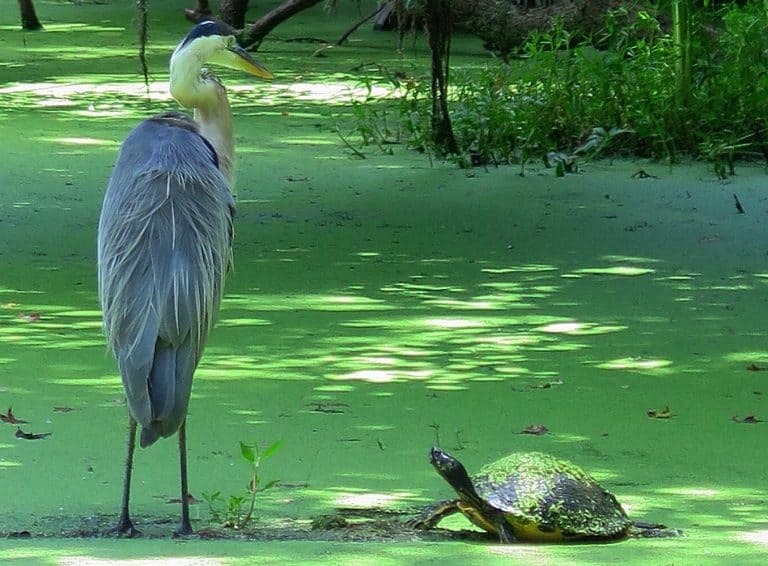 The half-a-mile long Cypress Swamp Nature Trail is perfect for families. Along the trail kids can spot magnolias and bald cypress trees. Looking to stay awhile in South Carolina on your Orlando family road trip? Consider a detour off I-95 to Charleston. Looking for kid-friendly things to do in Charleston? Check out Trekaroo’s Fun Things to Do in Charleston, SC with Kids. Truth be told, my favorite part about driving in Georgia on a road trip to Disney World are the peach stands. 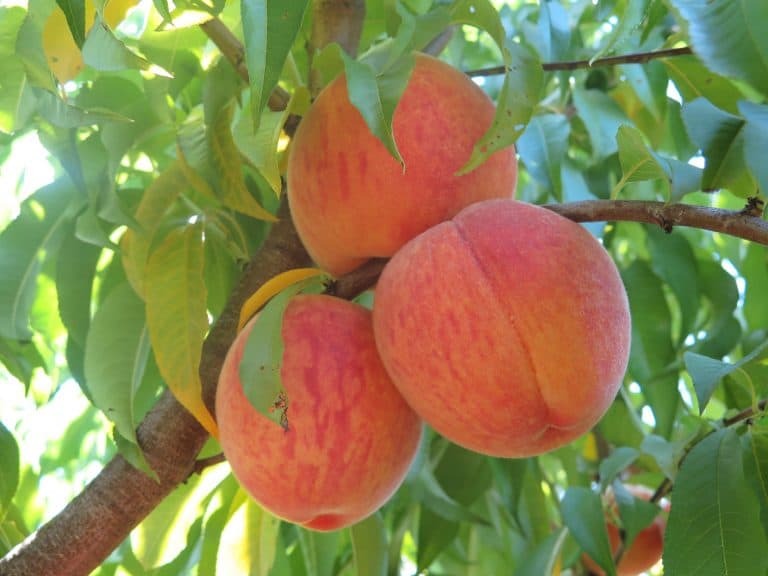 Georgia is the home of peaches and pecans, and there’s no problem finding either, as nearly every exit in Georgia has peach stands! Also, Darien, GA, not far off of exit 49, is a seaside village famous for shrimpin’ and food making the perfect place to stop for lunch in Georgia on a drive to Orlando. Darien has an old-school look and feel, and self-guided tours give a good reason to stretch out those legs. Chicken and waffles, a southern favorite, is a perfect choice. Planning to check out the coastal highlights of South Carolina and Georgia on your road trip to Disney World? Check out Trekaroo’s Family-Friendly Road Trip Charleston SC to Savannah GA.
I-95 Pit-Stops in Florida – You’ve Made It! Once you hit the Florida border, there’s only one thing on everyone’s mind- the beach! Jacksonville Beach at exit 341 and Daytona Beach at exit 261 are two family-friendly beaches with great restaurants and lots of play space for families. Don’t forget to pack a kite, as the ocean breeze at both beaches is ideal for kite flying! 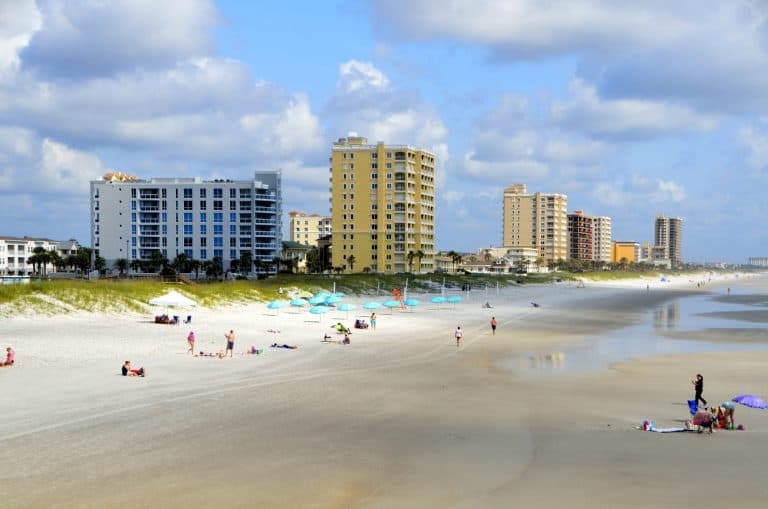 The beaches are a great place to take a few days rest on your Orlando family road trip. Looking for the fast track from Cleveland, OH to Columbia, SC? I-77 is your highway! Spanning 611 miles, along the way you can find good food, fun pit stops, and loads of family-friendly attractions. From Columbia, you can join up with I-95 South for the last leg of your journey on your road trip to Disney World. Leaving the shores of Lake Erie, you’ll soon be in Appalachia. Mountains stretch as far as the eye can see. It will take you at least three hours to cross the Mountain State on your road trip to Disney World. Consider a stop at the state capital or a state park to enjoy the mountain scenery! The Warther Museum is a unique museum located in Dover, Ohio off of exit 83. 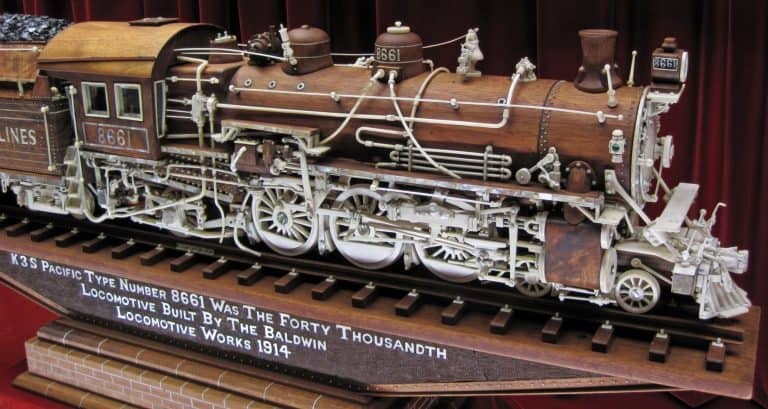 This woodcarving museum has several locomotive replicas, called “priceless works of art” by The Smithsonian. The collection is compliments of founder Ernest Warther’s love of trains. Driving the I-77 route on a road trip to Disney World, families pass through Charleston, capital of West Virginia. Take exit 99 for the West Virginia State Capitol Building along the Kanawha River. It is one of the most beautiful out of all fifty states with its gilded dome and marble interiors. It can even be seen from quite a distance away. If the weather is not quite right for a stroll around the gardens, take a look inside the extensive West Virginia State Museum. 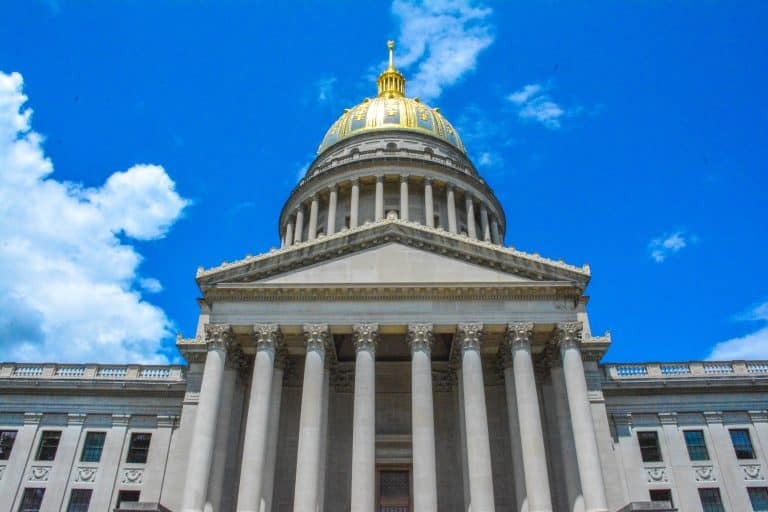 There is no cost to visit the West Virginia State Capitol Building, gardens and West Virginia State Museum; they are all free! Did you know that West Virginia was the only state born out of the American Civil War? There is a prominent statue of Abraham Lincoln in front of the state Capitol building so that West Virginians never forget their history. Charleston is a great place to spend the night on a road trip to Disney World. There are several great kid-friendly restaurants downtown. Check out Trekaroo’s recommendations for Spending a Day in Charleston, West Virginia Capital City. Lodging options in Charleston, West Virginia! Take exit 44 in Beckley to stop make a stop at the town’s Exhibition Coal Mine. Tours of the mine are offered frequently and take about 45 minutes. 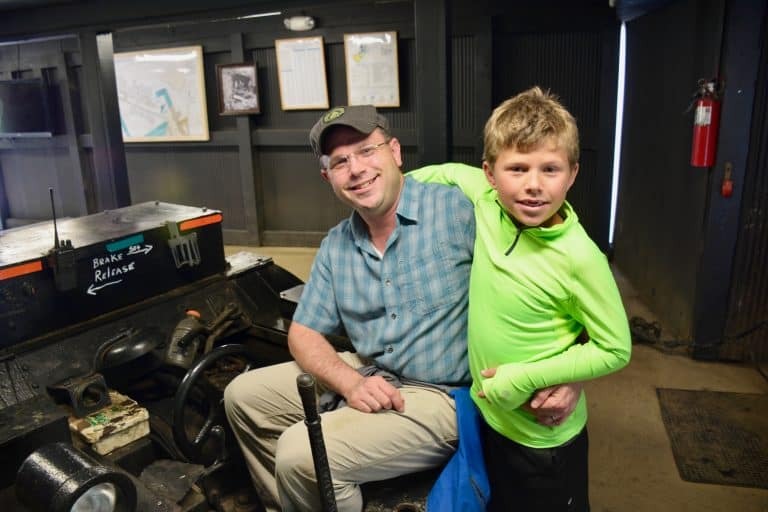 Kids love riding a train down into the mine as a retired miner explains how coal was mined in Beckley. Outside the mine there is a historical mining town set up for visitors to walk through. If you’re more the outdoorsy type consider driving another 90 minutes down the interstate and camping at Camp Creek State Park just off exit 20 in West Virginia. Camp Creek, one of West Virginia’s beautiful state parks, offers cabins, horseback and hiking trails, and several playgrounds to blow off some pent-up energy. Crossing from Virginia into North Carolina, visit Mt. Airy, NC off exit 81. This small town will make you feel as though you’ve been dropped in the middle of “The Andy Griffith Show!” One stroll down Main Street and you’ll think you’ve been transported to Mayberry. If you need to stop for the night, Charlotte, North Carolina is a good option. There’s lots to do in this Southern city that sits right on the border of North Carolina and South Carolina. A Trekaroo favorite is Carowinds off exit 90 in South Carolina. This amusement park is often called the “Thrill Capital of the Southeast!” Thrill rides, family-style rides, a waterpark, and even Planet Snoopy make this park fun and family-friendly. Soon you’ll be joining I-95, but first you’ll drive through South Carolina’s state capital, Columbus. From the South Carolina State Museum to the Riverbanks Zoo there’s plenty to see and do in Columbia, SC. Don’t forget to grab some southern barbecue before you leave South Carolina! Maurice’s off exit 18 in Columbia is a fan favorite. So many travelers recognize I-4 as the well-traveled highway to Disney and Universal Studios, but this interstate really has so much more to offer on your drive to Orlando! Fun dinner shows, exhilarating activities, and awesome attractions give road tripping families tons of spots for breaks and leisure. Chocolate lovers will want to keep exit 65 in mind for one reason: Chocolate Kingdom. With hourly tours, families learn how chocolate is transformed from a bean to a mouth-watering treat. Looking for fun dining? Choose exit 68 to dine like royalty at Medieval Times Dinner and Tournament Show or choose unusual sandwich options at Earl of Sandwich. Planning on driving through Orlando and heading toward Tampa? Make a pit stop on exit 17 and check out Dinosaur World. Kids will enjoy the fossil dig and life-size dinos while adults will adore the serene environment. Looking for some fun off the beaten path? Take exit 77 and in under an hour arrive at Wild Florida Airboats and Wildlife Park. Take a spin on an airboat through the Central Florida Everglades and visit the wildlife park while taking in a glimpse of what Florida looked like 1,000 years ago! Need an Orlando lodging recommendation now that your route is planned? Check out Trekaroo’s Best Orlando Hotels for Families. the purple pickle is no longer in Darien GA they closed up about a year ago, at this moment there is a Caribbean cuisine restaurant. Nothing really stays in that spot for long, hopeful that they will. Coming through Darien? get off the exit and head down HWY 17. Hungry? B&J’s Steaks and Seafood is where you NEED to go…seafood caught almost daily.. ALWAYS fresh.